Before learner drivers can book their practical test, they must first pass the theory test. For some learners it’s a walk in the park—no different to any other test they’ve taken in the past. For others, however, it can be a challenging roadblock to overcome. To pass, you have to face multiple choice questions and case studies revolving around knowledge of the road—and the Highway Code. Plus, there’s also the small matter of those tricky hazard perception clips. So, how do you pass? For many learners, the answer is through revision and mock tests—and in this field, Theory Test Pro has established itself as a leader. So, Theory Test Pro is certainly popular—but does it actually do the job? 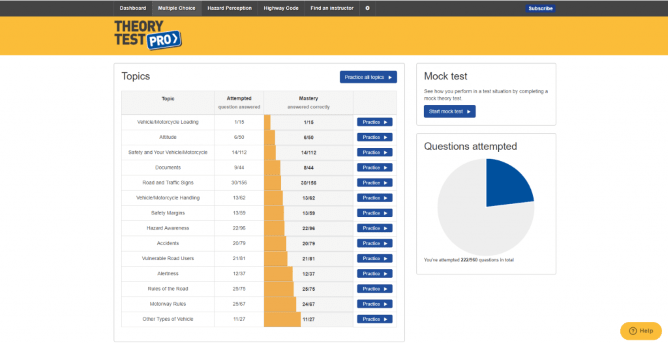 We’ve put together a full Theory Test Pro review—including handy screenshots—so that you can decide whether it’s worthwhile using the service to revise for your theory test. As we’ve mentioned, to pass your theory test, you need to know the ins and outs of driving, from the ever-important Highway Code to the rules of the road to hazard perception. If reading the Highway Code and DVSA handbooks has become a monotonous and useless process for you, Theory Test Pro might just be the perfect solution—it’s one of the many resources we’ve mentioned in our top theory test revision resources guide. 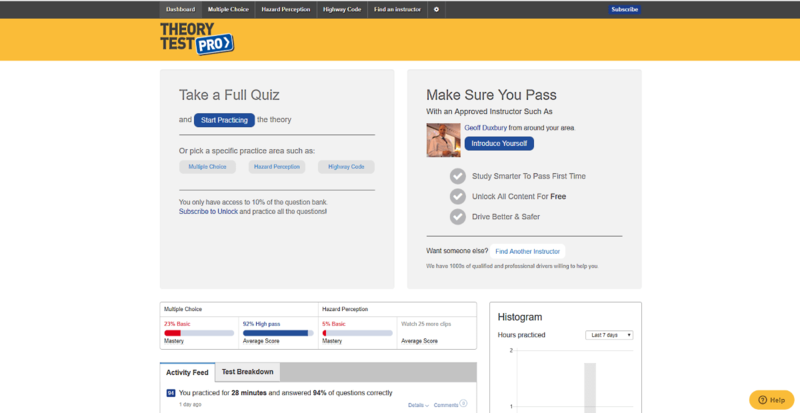 Theory Test Pro is a freemium product. This means that it’s free to use, but you need to make purchases if you want to use the premium features. If you’re a student, full-time worker, or you have a busy schedule, you’ll be pleased to hear that you can use Theory Test Pro in-browser or download the app. This is particularly advantageous as it allows users to revise at home and on the go. By doing so, you can build up your knowledge consistently and efficiently. Your choice of subscription is entirely down to you. We’d recommend starting out with the free version to see whether you like the revision style and layout. If you start to feel like you need more questions and hazard perception clips, you can get an upgrade. The £10 option is probably for more cost-effective than the £7 one, as it gives you 3 whole months to revise. This would even give you time to revise again if you end up failing. And, if you really want to play it safe, the one-off cost of £20 sets you up for the entire year! You can opt to download the app for Theory Test Pro or use it in-browser. For this particular review, we’ve concentrated mostly on the browser version—although we will briefly discuss the Android app. 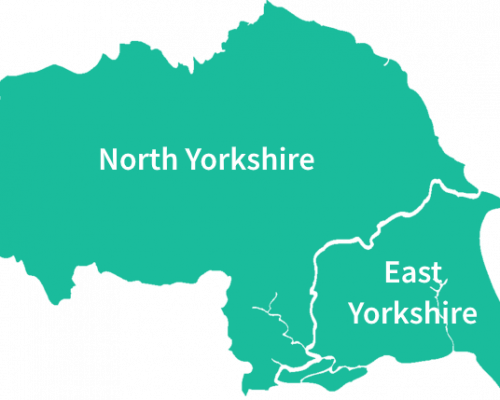 You can begin your journey with Theory Test Pro by signing up via their website. All you need to provide is your name and email address. You’ll then be asked to select your test type. You can choose from car, motorcycle, PCV, LGV and ADI. Don’t worry if you accidentally click on the wrong one—you can go back and change it whenever you want. Once you’ve selected your theory test type, you’ll be brought to the dashboard area. Here, you’ll find a variety of useful features. The first box you’ll see gives you the ability to immediately start practicing for the theory test with a quick quiz. Weaker in some areas more than others? That’s fine—you can choose specific practice areas: Multiple Choice, Hazard Perception and Highway Code. You should be aware that if you choose to use the free version, you’ll only have access to 10% of the question bank. To unlock the other questions, you’ll have to select one of the paid subscriptions. The box on the right provides you with nearby ADIs—giving you the chance to get in touch and introduce yourself. If you’re looking for help with your theory test or learning to drive for your practical, this is pretty useful. Below this box, you’ll see details regarding Activity Feed and Test Breakdown—we’ll look at this more closely further below. If you’ve previously revised for your theory test with official DVSA handbooks—or looked into it—you’ll know that there are over 900 variations of questions that could come up in your test. Some people take to reading the Highway Code and studying these handbooks religiously for a couple of weeks. If you’re more of an interactive learner, you’ll find Theory Test Pro’s approach much more appealing. You’ll be able to study for the theory test by topic groups—looking at Accidents, Vulnerable Road Users, Alertness, Motorway Rules and much more. As you work through each category, you’ll be able to track how many questions you’ve attempted and your overall “mastery” percentage. 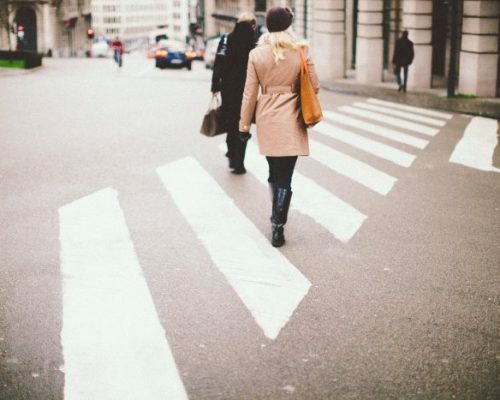 Let’s say you’ve chosen a topic to practice, e.g., Rules of the Road. You’ll be given a selection of questions in the category to answer. The layout is exactly the same as the official theory test—giving you the question and four possible answers to choose from. If you’re not sure of the answer, you can click “Knowledge & understanding” to get more information and a full explanation. You can choose to flag questions if you want to go back over them at the end of the quiz. Once you’re feeling a bit more confident with your driving knowledge, you can put your newfound skills into practice with a mock test. You’ll be given 50 questions with 57 minutes to complete them—just like the actual DVSA test. If you want to pass, you need to get 43 marks. 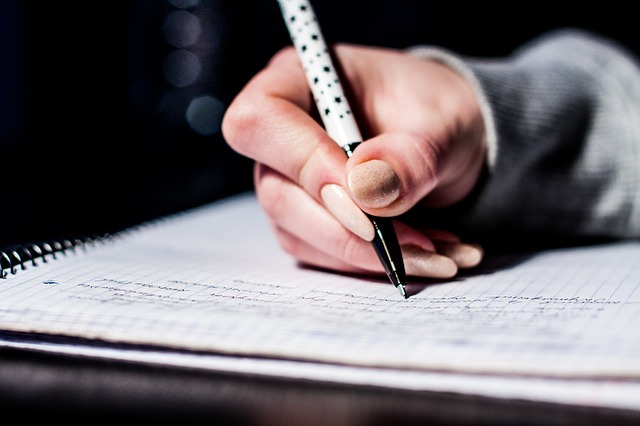 Arguably, mock tests are the best way to truly prepare for your theory test. The more familiar you are with the questions and layout, the less likely you are to panic on the day of your test. As long as you make your way through each topic—tracking your progress—you should find yourself retaining more information than you would by simply reading handbooks. Of course, it’s not all about the multiple choice section. The theory test will also include a hazard perception section. Here, you’ll be shown 14 clips of a car driving. It’s your task to click the mouse each time you see a developing hazard. The earlier you spot the hazard, the higher your score will be. 5 is the highest, while those who completely fail to spot the hazard will score 0. To pass, you need to get 44 marks out of 75. It can take a little while to get used to hazard perception. Sometimes we click too early and other times we just miss hazards entirely. 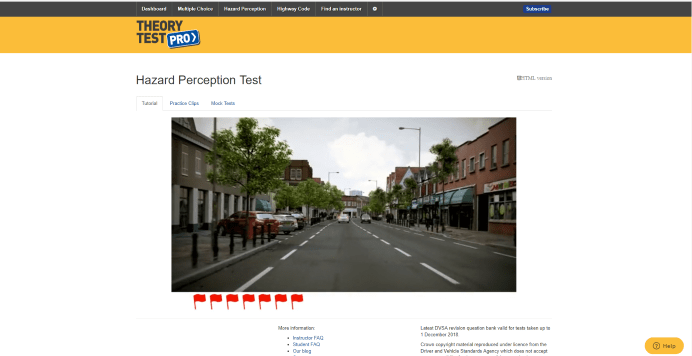 Fortunately, Theory Test Pro has plenty of hazard perception clips for you to test your skills on. Once you’ve finished a clip, you can then go back and see how you scored. It will run through how early or late you spotted the hazard. The video quality of the clips leaves something to be desired. It can be quite blurry—making it difficult to spot certain hazards. 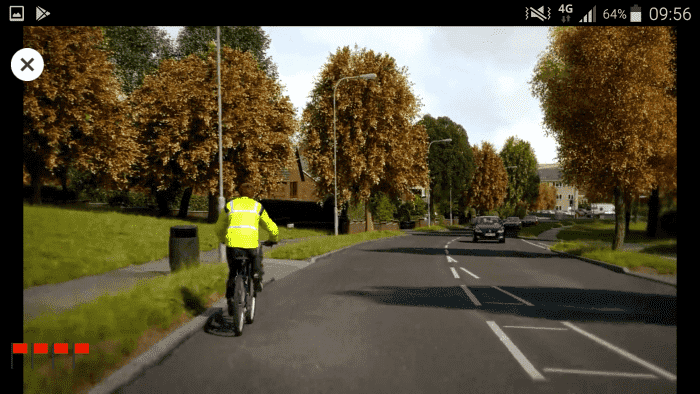 Of course, Theory Test Pro uses a lot of old DVSA clips—so it’s not entirely their fault. Nowadays, the DVSA makes use of CGI clips, which are higher in quality and make it easier to spot hazards as they develop. 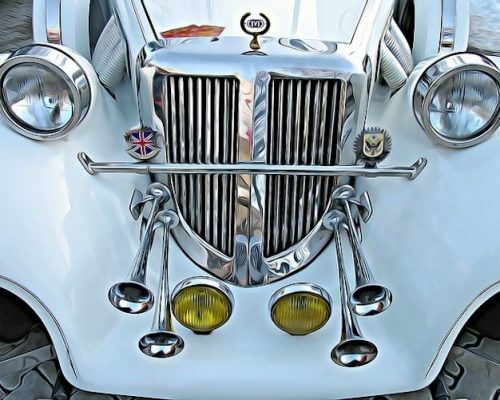 The Highway Code has had an interesting history since its inception in 1931—undergoing drastic changes over the years to keep the public safe on the roads. It’s essentially a compilation of all the vital information and rules that drivers in the UK need to know. Safety is important on the road, which is why the DVSA recommends that road users read it. From L plate rules to road signs to general road safety—the Code contains all the necessary information you need to know. Not sure it’s relevant to you? You couldn’t be any more wrong. 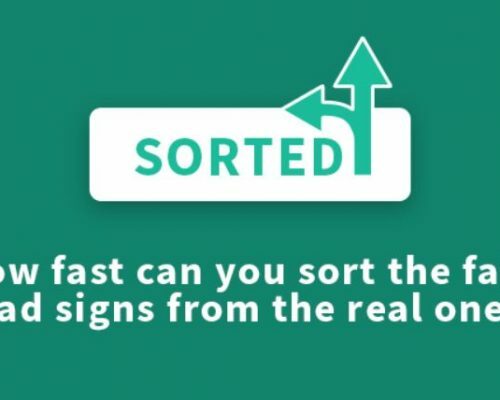 Most of the questions you’re asked in the theory test relate to the Highway Code—so it’s incredibly vital that you get accustomed to it. If you’re not sure where you can find a copy of the Code, you’re in luck. You can find the entire contents of the Highway Code in the Highway Code section on Theory Test Pro. Everything is split into sub-sections so you can find information quickly. Even if it’s just a quick read through, every little bit helps when it comes to building up your driving and road knowledge. We all love statistics—that’s why driving test pass rates are so popular amongst learner drivers. 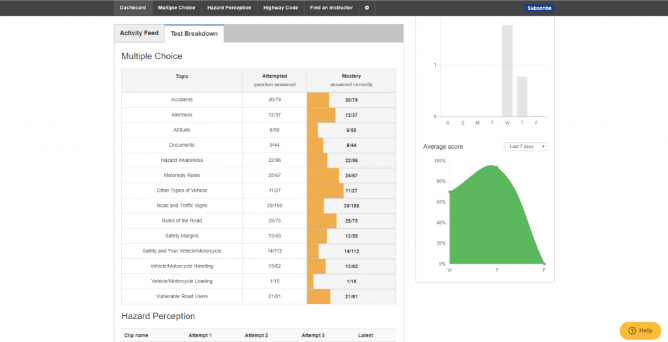 Theory Test Pro allows us to take this love to a new level with their Activity Feed and Test Breakdown features. The Activity Feed tracks how long you’ve practiced for and the percentage of questions you answered correctly in that time frame. If you click on a particular session, you’ll be able to see your activity broken down by topics for multiple choice and hazard perception. The Test Breakdown tab breaks down your progress. You’ll be able to see how many questions you’ve attempted in each category and how many you’ve answered correctly. You can also see which hazard perception clips you’ve attempted and your latest marks. When you complete a practice quiz or mock, your results will contribute towards your Activity Feed. This means you’ll be able to track how well you’re doing in specific topics and what your average mark is. Finally, the Histogram tab gives you a full breakdown of how many hours you’ve practiced in the last 7 or 30 days. This is a pretty handy feature, giving you the ability to keep track of how much time you’re dedicating to your revision. If you set yourself a target of revising for 1 hour a day, this chart enables you to stick to it. You can also look at your average score percentage—giving you a rough idea of how much you’ve progressed. 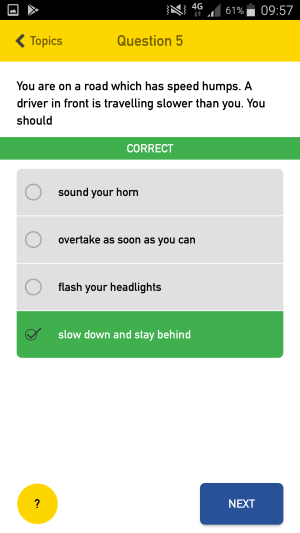 As we’ve said, you can download the Theory Test Pro app on iOS or Android. This can be particularly useful for when you need to revise on the go. While the browser version has more capabilities—and offers more realism, considering you’ll be taking your test on a computer—the app gives you far more flexibility when you go about your day. When you open the app, you can choose to log in with your email or continue as a guest. The home screen then gives you the option to revise for the hazard perception test or the multiple choice. As with the browser version, you can choose to revise for the multiple choice section via topic—being able to track how many you answered correctly—and take mock tests. Plus, you can practice hazard perception clips! One of the main disadvantages with the app, however, is that you can’t view the dashboard statistics available in browser. Of course, if you use the app in conjunction with the browser—which we definitely recommend—this shouldn’t be a problem. Is Theory Test Pro Worth it? We definitely think that a lot of our students benefit from the more interactive ways of revising. Whilst some people don’t mind reading through the Highway Code and looking through DVSA handbooks, others find it too tedious—often forgetting most of what they’ve learnt by the end. Theory Test Pro could be the perfect answer to this problem. Learning to drive is an investment. So if you want to pass your theory test the first time around, then £7–20 is a worthy price—especially when you consider all that’s at your fingertips should you choose to use the paid version of Theory Test Pro. Of all the the theory test revision resources out there, Theory Test Pro is certainly up there with the best. Not sure? Try out the free version of Theory Test Pro for a couple of days. This will give you time to see what’s on offer and decide whether you want to use the paid subscriptions. 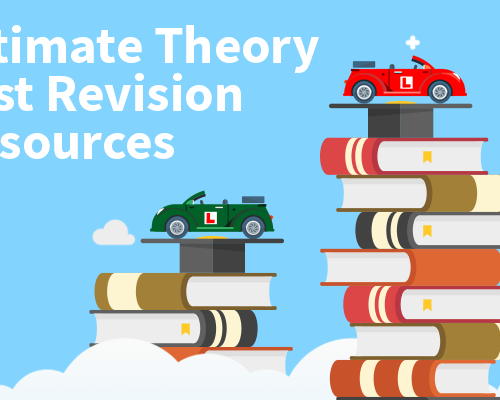 Looking for more help with revising for the theory test? Check out our guide on how to pass your theory test!